PAINLESS ELECTROLYSIS IS IT POSSIBLE? Pain is a subject that very electrologists will talk about so I thought why not? For the record depending upon the skill, education, experience and expertise of your electrologist very few people are aware that there are no nerve fibers in the follicle structure. Henceforth, if your electrologist is trained, tested, educated, licensed, registered and skilled strictly at electrolysis only you most likely have a good treatment. However it is important that you understand that the competency levels of electrologist vary and one fact that people who seek a qualified electrologist fail too notice is motivation to do an excellent job. With all of these attributes checked off you should have an excellent treatment that is virtually pain free? WHAT IS THE CAUSES PAINFUL ELECTROLYSIS? There are three distinct categories that cause painful electrolysis treatments the first being an uneducated non-licensed electrologist who did not take the time to attend a nationally accredited electrolysis school that is state licensed and registered. Fact, Arizona has no educational requirements to practice electrolysis and 99% of the electrologists in Arizona are not licensed and never took more than a weekend wonder certification course to become an electrologist. Fact, non-licensed electrologists are not competent in addition the quality of their treatments border on negligence. Fact, Arizona is the "Wild West" and capital for fraudulent hair removal scams from weekend wonder courses in electrolysis to a fifty-hour quickie course to become a Certifiable Laser Parlor Operator. Fact, non-licensed electrologists and a laser parlor operators will cause damage to your skin and emotions and most of them are certifiable non-licensed quick buck scam artists that do both the laser and electrolysis. WHAT IS THE SECOND CAUSE OF PAINFUL ELECTROLYSIS? Without one doubt the second cause of painful electrolysis is that you have had your skin and emotions traumatized by a non-licensed electrologist or a certified laser parlor operator or both. Fact when one both of both of them has traumatized your skin it can be painful just to touch your face. Fact sub-standard electrolysis is bad enough however the most dangerous fact about the laser is permanent second and third degree disfiguring burns. In addition I have seen cases where the laser damages sensory nerves of the skin and the patient is left with or develops acute neurological damage with the end result being chronic pain where just touching the skin hurts. WHAT IS THE THIRD CAUSE OF PAINFUL ELECTROLYSIS? The third and most severe cause of painful electrolysis is when the patient with a moderate to severe unwanted facial hair problem who out of frustration and anger and frustration has given up. These patients after having substandard electrolysis treatments and temporary laser hair removal become so discouraged the will resort to plucking their faces up to two hours per day. In addition they start shaving, plucking, waxing on regular basis with the final insult being that they need to shave at least once or twice a day. Without one doubt this is major cause of painful electrolysis because not only has your face and skin been traumatized but your emotions to and how you see yourself have become distorted. This is the most painful because not only is your skin painful to touch but your feelings and emotions have been hurt by unscrupulous non-licensed quacks that betrayed your trust with their lies. IS PAINLESS ELECTROLYSIS FOR YOU? Painless electrolysis can be achieved with local anesthesia however it is important that you understand that you should be evaluated and tested before the start of treatment. Fact, I understand from personal experience how important it is to comprehend your needs when it comes your treatment. For the record I have seen patients that have been so traumatized by sub-standard treatment that its is difficult if not impossible for them to realize that the majority of electrolysis treatments are a pleasant experience. However you can be evaluated and if after one or two treated hairs if you want to opt for anesthesia that is fine. However remember I stated that there are no nerve fibers in the follicle and when electrolysis is performed correctly the patient often will fall asleep on my table. 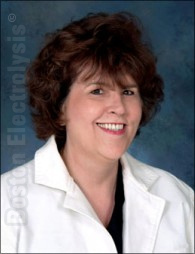 For the record most patients at Boston School of Electrolysis have no need of local anesthesia however patients with minor to severe facial problems hypertrichosis who want rapid clearing with an electrolysis intensives using high current can have local anesthesia. Fact, I have local anesthesia available however you must be informed that too many non-licensed and inexperienced electrologists look upon and regard localized anesthesia as "Cart Blanche" to use unlimited amount high amounts to attain the quickest electrolysis results possible. Fact, it is wrong and from my professional experience and 27 years of professional expertise I know that excess current will not clear you any quicker and it will result in skin damage. Fact a professionally trained experienced licensed and registered electrologist with minimum ten years experience knows the exact amount of current required that will not cause skin damage such as pitting and cicatrix formations. The key to successful painless electrolysis is not only the local anesthesia but also knowing just how far you can you can raise the current with out causing harm to your patients skin. Fact, and for the record I have had patients say, "I don't care if it causes scarring or pitting just get rid of the hair." For the record this is when you hope your electrologist has ethics and common sense and remember the part of the Hippocratic oath that physicians swear to, "Not to make it worse." Fact I will not do that in addition quite a few patients will say, "Plastic surgery will fix it", wrong most plastic surgeons know that skin that has been burned, pitted and scarred cannot be repaired. Painless electrolysis intensives are the new wave of the profession and the best way to shorten your treatments time depending how much hair you have and how quickly you want to get rid of you unwanted facial hair problem.